Lloyd Braun is a one-man convergence story: He ran Disney’s (DIS) ABC, then Yahoo’s (YHOO) media group, and now makes up half of BermanBraun, which makes movies and TV shows and Web stuff. Steven Levitan, meanwhile, makes good old-fashioned TV shows like “Frasier” and “Just Shoot Me.” But he earned digital bona fides this spring, when his hit show “Modern Family” used Apple’s (AAPL) iPad as a plot device in an episode that aired shortly before the gadget went on sale. Time to compare and contrast! 4:11 pm: Here are a couple clips from that aforementioned “Modern Family” episode. And now here are Braun and Levitan–“actual creators of content,” as Kara describes them. 4:11 pm: Levitan goes through his TV bio, which includes “The Larry Sanders Show,” which is awesome. All of you should go get the DVDs. 4:12 pm: Braun’s bio–started as a lawyer and had Levitan as a client. Then off to Brillstein-Grey, then Disney, ABC, two years at Yahoo, then hooking up with former Fox boss Gail Berman. 4:14 pm: Kara to Levitan–You don’t really care about digital, right? Levitan: It’s changed little things, like how we share scripts and information, collaboration tools, etc. “But at its core, 90 percent of my job is still sitting down in a room full of people, and breaking stories…and that requires virtually no technology.” So interview’s done! Ho ho ho! Just kidding. 4:16 pm: Kara to Braun–What do you think? Has tech changed development of TV? Braun: Nope, not really. Not at the pace you might think. People like Braun think of making TV shows. Digital pieces are things you think about if you have to think about them, and no one has time to think about them. Digital “is frequently a stepchild” to the television show. The marketing people do it. But! In the future, TV shows won’t be TV shows. They’ll be brands. And TV will be a primary distribution model, but not the only one. That may be years off, but that’s where I think it’s going. 4:18 pm: Kara to Levitan–Does that sound right to you? Not really. We talk about stuff we can do on the Web, and I spend a lot of time on the Internet. But I feel like fundamentally–I don’t know…when they come to us and say, “now let’s do some summer content” for the Web, I worry that it will drive people to the Web site and not the show, and it will make the show less good. And the Web stuff can’t be as good as the show, because it doesn’t get a full effort, because that’s what we use for the show. 4:20 pm: Kara–What about Twitter, etc.? 4:23 pm: Braun–Here’s the problem. Success for Levitan and everyone else is about the ratings the night the show airs. That’s the only metric that matters. So Steve used the word “dabble” to talk about the Web, and I felt the same way at ABC. But that isn’t what the full story is going to be for all of these shows. And if we think that way, we’re going to miss out on what the medium can do. We need to figure out “how to turn these different platforms into real businesses around these shows.” And until it’s your job to do that, you won’t. 4:25 pm: Kara asks about Hulu. Levitan: It’s tricky. In the business, we often wonder, “How is this helping our show?” We’ve been asking for about six months, and we now think about two million people are watching our show on Hulu. That seems to be what successful shows get. I’m guessing, “because there’s very little transparency on Hulu.” Anyway, the problem is “we’re not getting any credit for that. Anywhere.” And two million viewers for us would be huge. That could really boost our ratings. And we don’t get money for it, either. “I question partially, the point of it, the ultimate wisdom of it….I know that what we do takes a significant investment on the studio’s part,” so if anything siphons that success away, why do that? “Television is about sustainability.” Lots of people can make one-offs, but to sustain a show, making 24 episodes a year, takes a lot of money and effort. It’s hard. 4:28 pm: Braun–Here’s the counter. You have to make these shows available on the Web, because people are going to get them anyway. It’s harder to steal the files, but not that hard. You have to condition kids not to steal this stuff. They think that it’s like drinking water. They think that buying music is like burning money. 4:30 pm: Now Kara wants to know about Yahoo (of course). What happened there, she asks Braun. Can the media and tech sides really not function together? Braun: I learned a lot there in two years. But yes, all of the big portals are technology companies. They don’t really get media. And media people don’t really get technology. My media friends can’t tell me how Google (GOOG) makes money. They don’t understand search ads vs. display ads, etc. It’s never been explained to them. I was in the same position when I went there. 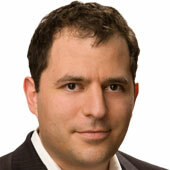 4:33 pm: Kara asks Levitan if he can imagine creating a hit for the Web? Levitan: It doesn’t make sense to do it. During the writers strike we all talked about it, and Joss Whedon made that great “Dr. Horrible” short, but he pulled in lots of favors and leveraged his brand. He got there by working in conventional entertainment. There’s not enough upside for us–“the money, the payoff, the audience, is still at the end of the day, in traditional media, right now.” I have friends who do stuff for “Funny or Die” or YouTube. But it’s a hobby for them. There’s no way to make real money. Seth MacFarlane’s deal with Google, I don’t really know what that was. 4:38 pm: Levitan: Everyone who tried to monkey around with the Web during the strike, either because they had money and could afford to do it, or because they didn’t have anything else to do–they’re all back writing for TV. Q: Talk some more about Twitter. Can you use it as a promotional tool? Levitan: [grudgingly] Yeah. Sort of. But really, it’s a feedback tool. When something strikes a chord, we really get a sense of it. Kara: Would you ever take suggestions from the Web–changing endings, etc? Braun: Sure. But that’s a stunt. It doesn’t move the needle. Q: Wenda Millard asks Braun to talk about Wonderwall and Glow, two sites he helped create for MSN. Gets 12 million uniques for Wonderwall, five million for Glow. These are mass audiences. So we’re programming for 15 million uniques. Add the politics site we’re launching and we’ll get to 20 million. Not users, people. And a billion page views. The question is, how do you program to that? Kara asks Levitan if he sells ads on his Web site. Levitan: We don’t have a Web site. ABC puts it out. One interesting point from Braun: At big Web companies–or at Yahoo, at least–it’s hard to focus on display, with 50 percent margins, when you can focus on search, with 80 percent margins. Q for Levitan: Why don’t you make cool stuff for mobile? Levitan: Here’s the problem. I love technology. I love it more than 98 percent of people in television. And I came into it with a genuine desire. I was grabbing domain names before I turned in that [“Modern Family”] script. The first thing that happens is, you have to do a show. That’s a big job. It can be 18 hours a day. So then to go, on top of it, let’s do that funny thing for mobile–and we’ve done it; we put a funny music video on the Web, it was an enormous amount of work, no one got paid, and at the end of the day, you go, “we think it helps the show, but the system right now is not designed to promote these things, to nurture these things.” If we got ratings from Hulu, at least we’d get a benefit from that. Or the ABC iPad player. We have no clue how many people are watching on that app, and the people who sell that show don’t get credit for that.